Each Friday, the Digest surveys the burgeoning L.A. restaurant scene and compile this (highly unscientific) list of the most hyped and heralded restaurants in town this instant. Whether old or new, big or small, near or far, these are the restaurants that have people talking. Whatever that means. Anyway, we recommend getting a seat at these places while you still can. Ludo Leferve’s new French bar-bistro is on top of it’s game right now, having scored top marks from two of the city’s prominent restaurant critics. Offering just 24 bar stools and no reservations, the traditional Burgundy fare, like steak frites and chicken leg confit, is certainly worth the wait. Sip wines and cocktails at the long marble-top bar and pretend you’re chilling in Paris. Tsujita is the gift that keeps on giving. After opening two ramen restaurants, the Japanese-based company has launched an elegant sushi bar just one block north along Sawtelle. The focus is on precise and intricate omakase meals at dinner—the most basic option starts at $120 per person—but lunch is far more affordable, including a great chirashi bowl deal studded with fresh sashimi. The old A.O.C. space has been transformed in Pistola, an Italian steakhouse that pays homage to the classy red sauce and porterhouse joints of yesteryear. Co-owners Vic Casanova of Gusto and Seth Glassman of Rivabella plans to offer a dozen or so house-made pastas, and roster of dry-aged beef cuts. To drink there’s a selection of classic cocktails, an Italy-dominated wine list, and a few amaro for after-dinner sipping. An all-vegetable restaurant in Studio City? Phillip Frankland Lee’s new restaurant isn’t being billed as a vegan, but the Scratch Bar chef has created a fixed menu of meat-free dishes that focus exclusively on the flavors of local produce. Housed in a rather intimate cottage, diners will have the option to enjoy a fixed-price omakase-style menu as well as soju cocktails made with fresh-pressed juice. Sotto chef Zach Pollack is putting his own spin on Northern Italian cuisine at his long-awaited Silver Lake restaurant. If thick-cut mortadella sandwiches, mackerel conserva and biodynamic Nebbiolo are your jam, then this is your kind of place. As a bonus, expect brunch to debut in the next couple weeks. Roy Choi’s rooftop greenhouse restaurant is open for business at Koreatown’s The Line Hotel. Serving vegetable-focused dishes and cocktails, Choi has dubbed the the poolside, garden-themed eatery as “a country club for the public.” The space should be a fine compliment to POT, Lobby Bar, and CaFe a.k.a. The Line’s other eclectic food and beverage outlets. Koreatown’s new wave of exciting restaurants continues with this subtle strip mall-enclosed wine bar on Western. On the ambitious menu from chef Nick Erven look for small plates like spot prawn tartare, sea urchin tataki with avocado and seaweed Doritos, and pecan-smoked brisket with hoisin. Owner and chef Joan McNamara has finally opened the second branch of her beloved restaurant and marketplace on Third Street. As with the Beverly Grove location, you’ll find a huge curated assortment of cheeses, charcuterie, salads, and fresh pasta enclosed in deli cases, as well as a reliable menu of sandwiches, pastries, soups, and salads. There will also be a Stumptown coffee program, ice cream from Sierra Madre’s Mother Moo, and beer and wine available for there or to-go. After a long-delayed build-out on Sawtelle, this Las Vegas-based burger restaurant has opened its doors along Little Osaka’s restaurant row. 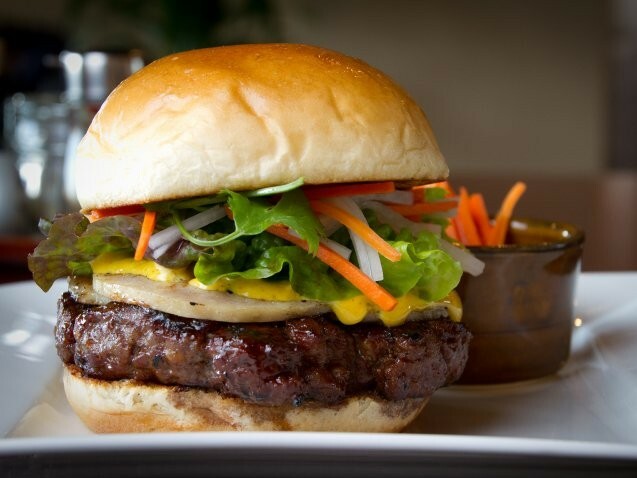 The menu mirrors many of the upscale creations you’l find at the mini-chain’s two Vegas locations, including a Wagyu beef patty topped with roasted garlic, bleu cheese, mushrooms, spinach, and bacon, as well as a Chinese sausage burger served on a purple-hued taro bun. Armed with truffle-topped lobster rolls, fresh oysters, and Basque-style braised mussels with chorizo, this nautical-themed bar and restaurant hopes to bring a dash of East Coast attitude to Venice’s Main Street. Grab a seat on the large outdoor patio, festooned with strings of lights, and enjoy a glass of wine and craft beer alongside laid-back locals.